The Ohio Democrat opposed wars that needed to be opposed, fought to preserve civil liberties and always sided with workers and farmers against corporations. Dennis Kucinich has had many political lives. Elected to the Cleveland City Council in 1969 at age 23, he was in 1977 elected as that great American city’s “boy mayor.” Kucinich’s refusal to bend to the demands of the downtown banks and the utility corporations that wanted him to privatize public services led to a withering electoral assault that would eventually force him from office. For much of the 1980s, Kucinich was a political pariah, running and losing races in his native Ohio and slowly fading from the national limelight he had once enjoyed. Then, in the “Republican revolution” year of 1994, Kucinich stunned local and state (and even a few natrional) observers by emerging as one of only a handful of Democratic legislative candidates to upset a sitting Republican state senator. Two years later, he ran for Congress against one of Newt Gingrich’s Republican lieutenants and won a Cleveland-area House seat. The Kucinich who came to Congress in the 1990s was every bit as incorruptible and uncompromising on principle as the “boy mayor” who fought Cleveland’s crony capitalists in the 1970s. He opposed trade deals, deregulation schemes and, most notably, the wars of whim of Democratic and Republican presidents. By 2000, he was arguing that Democrats should include in their platform a proposal for a “Department of Peace” that would use diplomacy, development aid and environmental initiatives rather than drones, occupations and crackdowns on basic liberties to create real security for the United States and the planet. Kucinich’s ardent opposition to George W. Bush’s rush to war with Iraq—which began when most Democrats were still deferring to Bush in the aftermath of the September 11, 2011, attacks—identified him (with California Congresswoman Barbara Lee) as the rare congressional champion of a burgeoning anti-war movement. That championship led to calls—from Studs Terkel, among others—for Kucinich to seek the presidency. And, though his 2004 and 2008 presidential runs fell short of the popular vote and delegate totals needed to secure the party’s nomination, they were long on ideas. Even those who dismissed Kucinich as a serious presidential prospect admitted that he forced his fellow candidates to address questions of war and peace, economic justice and civil liberties that might otherwise have been neglected. Kucinich played a pivotal role in the 2008 Iowa Democratic presidential caucuses. In precincts where there were not enough Kucinich backers to reach the 15 percent threshold for securing delegates, the Kucinich camp urged supporters to caucus with backers of Barack Obama. Kucinich’s assist to the one major candidate who had opposed going to war with Iraq helped Obama establish a six-point lead over John Edwards (and an eight-point lead over presumed front-runner Hillary Clinton) in Iowa. The strength of that showing propelled Obama into serious contention for the nomination. After the 2004 campaign, Kucinich’s backers organized into a highly effective advocacy and campaigning group, Progressive Democrats of America, which remains a presence nationwide. And the congressman returned to the House. 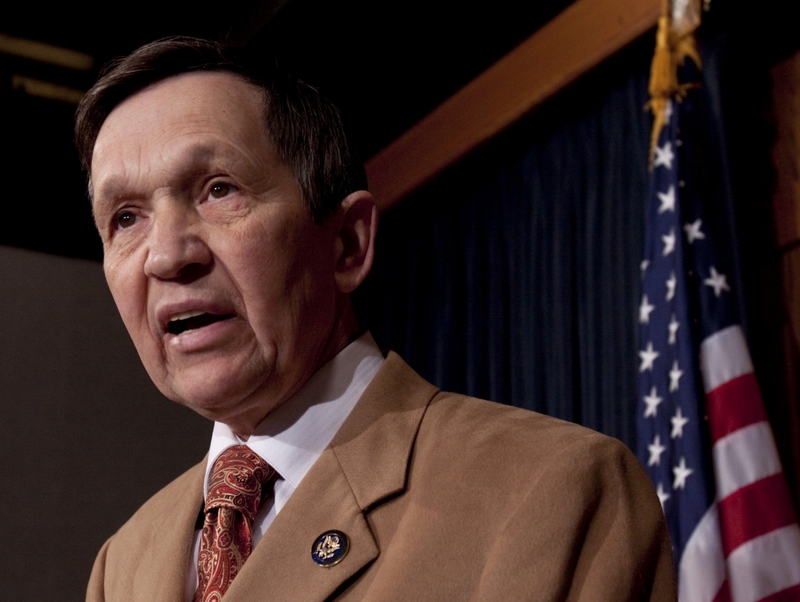 Despite the role he played in aiding Obama’s candidacy, however, Kucinich continued to serve as an independent progressive. As he had during the Clinton years, Kucinich frequently led the left opposition to a centrist Democratic administration. He could bend when it seemed absolutely necessary—as he did on the vote for the Affordable Care Act. But when Obama sent more troops to Afghanistan, bombed Libya, extended the national-security state or approved new free-trade deals, Kucinich refused to go along. Frequently, his was the House’s clearest and steadiest voice of progressive opposition to compromises by his fellow Democrats. And, in a chamber where there was much talk of the Constitution, it was Kucinich who fought some of the loneliest—yet most necessary—fights to restore the rule of law, especially when it came to the requirement that wars be declared by Congress, not launched on the whim of presidents. Kucinich’s independence left him vulnerable when Ohio Republicans redrew congressional district lines before the 2012 election. The congressman was thrown into a new district with another Democrat, Congresswoman Marcy Kaptur, to whom he lost a primary. And now, Kucinich has finished his eighth term in the House—and his current congressional tenure. The Congress will be diminished by his absence, and that of two other steadily anti-war representatives who are retiring this year: California Democrat Lynn Woolsey and Texas Republican Ron Paul. But as someone who has seen Kucinich rise and fall and rise again, I would caution against assuming his political journey is done. If there is a wrongheaded war to be opposed, an economic injustice to be challenged, an environmental crisis to be recognized and addressed, Dennis Kucinich will be raising his voice. And I would never, ever rule out the prospect that he might well do so once more as a member of the House or in some other elected post. It’s not that Kucinich needs personally to remain in politics—he could do many other things—it is that America will again need his conscience, his clarity, his courage.